"saving the world one service call at a time"
GRIPS Inc. offers service and maintenance programs to respond to the increasing complexity and cost of maintaining HVAC systems. No matter what type of mechanical system you have in your building, it will require maintenance to insure that you are receiving the maximum benefit from your HVAC system. Our service technicians are licensed and trained to maintain these complex systems. Our service department is structured to respond to your needs around the clock. 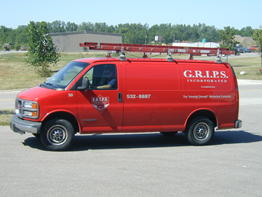 So no matter what time of day or night it is, you can be assured that you have a resource in G.R.I.P.S., Inc. that will be there for you to regularly maintain your HVAC system and respond to service when needed. Periodically maintaining your HVAC equipment is as important as changing the oil in your car. You can insure equipment dependability and efficiency by having G.R.I.P.S. perform our multi point inspection and filter change on your HVAC equipment periodically. We can tailor our maintenance program to fit your needs an budget. Program maintenance should be done at least twice per year (spring & fall) we recommend 4 times per year. Do you have a boiler? G.R.I.P.S. is licensed to perform the state required CSD-1 reports annually.